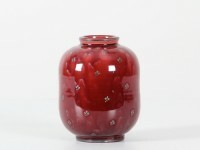 Originally a painter, Wilhelm Kåge was employed by Gustavsberg as an art director to rejuvenate the pottery´s production. He was faithful to the company for 32 years. In 1942 he started the legendary Gustavsberg Studio with the mission to create unique artistic pieces. His lively imagination brought forth a great variety of forms. Kåge was an artist of contradictions. In the 1940´s and 50´s he designed several geometrical, almost cubist, vessels in the "Surrea" series which stands in striking contrast to his soft formed, organic shaped tableware from the same period. Kåge designed more than 30 different dinner services, of particular importance was the inexpensive "workers" service, intended for a wider audience. 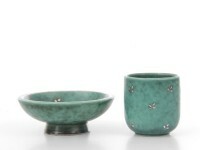 Kåge´s pride, however, was the Farsta series of unique vessels made of heavy stoneware with carved surfaces and earth coloured decorative glazes. The clay for which was taken from the Farsta bay area very near the Gustavsberg pottery. 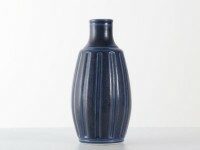 He began experimenting with the Farsta line of studio ceramics already in the 1920´s. 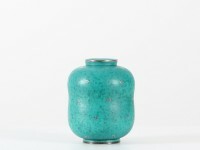 Art historians and collectors today consider the Farsta pieces the culmination of Wilhelm Kåge´s artistic production.